Roslyn Feldman, an 88-year-old woman from Brooklyn, NY, lost her life savings of $60,000 by playing fraudulent sweepstakes over a two year period. She believed she was a winner when she started receiving solicitations with phrasing like “You Have Won Money” and “You have already won, you need only to claim your check” printed in large colorful fonts, along with official looking seals of approval and facsimiles of checks she would receive. Mrs. Feldman lost her husband years earlier and wanted to prove to her son that she was financially independent, so when the sweepstakes came in the mail she thought her prayers had been answered. Los Angeles, CA (PRWEB) June 19, 2010 -- Roslyn Feldman, an 88-year-old woman from Brooklyn, NY, lost her life savings of $60,000 by playing fraudulent sweepstakes over a two year period. She believed she was a winner when she started receiving solicitations with phrasing like “You Have Won Money” and “You have already won, you need only to claim your check” printed in large colorful fonts, along with official looking seals of approval and facsimiles of checks she would receive. Mrs. Feldman lost her husband years earlier and wanted to prove to her son that she was financially independent, so when the sweepstakes came in the mail she thought her prayers had been answered. The catch: she needed to send in a processing fee which ranged from $5 to upwards of $50 per offer. What she did not see was the fine print, often on the back of the solicitation printed in small gray print declaring the offer was not a contest, only a solicitation to purchase an easy to read compendium that lists individual sweepstakes she could enter separately. Once she sent back the first processing fee, more offers started showing up in her mailbox and most days she received thirty different sweepstakes offers. But the companies sending the sweepstakes use multiple names with the same Post Office Box, for example one company goes by twenty different names, so she was in fact sending money to the same place instead of the twenty individual contests she thought she was entering. Mrs. Feldman also received sweepstakes offers from non-profit organizations with deceptive phrasing where she thought she was required to give a gift in order to claim her prize. The words “no donation necessary” were written at the bottom of the page in italics, which italicized fonts are 18% harder to read for seniors rather than regular fonts. Mrs. Feldman suffers from glaucoma, leaving her blind in one eye, and a variety of other health issues. The wording on these mailings is confusing and goes against the Deceptive Mail Prevention and Enforcement Act Congress put into place in 1999 to stop fraudsters from using sweepstakes scams to prey on people, especially seniors. When the National Telemarketing Victim Call Center heard about Mrs. Feldman’s case, we knew we had to get involved. Having no one else to advocate for her, NTVCC separated the sweepstakes offers, created a database of the company names, and sent letters demanding the return of her money. NTVCC filed complaints on Mrs. Feldman’s behalf with the Attorney General of New York’s office and with the Postal Inspection Service not only to raise awareness of the sweepstakes scam problem, but also to get law enforcement involved in stopping the companies sending these solicitations. When researching the companies listed on the thousands of sweepstakes offer Mrs. Feldman received, many are completely bogus, having no business license or office address other than the Post Office Box listed on the mailing. So far NTVCC has collected $14,000 that will be returned to Mrs. Feldman, who does not know how successful we have been at getting her money back. Melodye Kleinman, Executive Director of NTVCC, will hand deliver the money to Mrs. Feldman at the end of the month and do a special one-on-one scam education session with her, that will include going to Mrs. Feldman’s local bank branch and setting up some safeguards with her branch manager. NTVCC has been working with Mrs. Feldman over the past three months, and in such a short time, we have seen a change in her patterns. 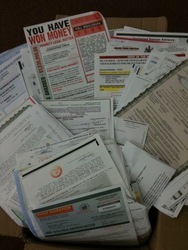 Mrs. Feldman will now admit “it’s a scam” and rips up sweepstakes offers that come in the mail. Roslyn Feldman is a winner, she won big with the National Telemarketing Victim Call Center, and will continue to win every day she does not fall for sweepstakes scams. The National Telemarketing Victim Call Center (NTVCC) is a nonprofit organization that provides education and prevention services to older consumers who have been victimized or are at risk of being victimized by Mass Marketing Fraud. We are primarily funded through the AARP Foundation as a result of a settlement fund with the National Association of Attorney Generals. Based in Los Angeles we work closely with federal, state and local law enforcement agencies, including the Federal Bureau of Investigations, the California Department of Corporations, U.S. Postal Inspection Service and the California Attorney General. With a combination of part time staff and a large contingent of volunteers, each year we provide one-on-one counseling to over 150,000 consumers. Most of these counseling sessions happen over the telephone when we call a consumer whose name and telephone number appear on a lead sheet or “mooch” lists seized by law enforcement when a “boiler room” or telemarketing sales operation has been closed down. NTVCC counsels individual as well as groups of consumers regarding the appropriate agencies to complain to in order for them to be included on any victim or restitution list. NTVCC also forwards offering material and names of helpful witnesses to regulators and law enforcement regarding ongoing solicitations so they can proactively shut down and prosecute illegal companies before more people are taken.